Photos by Joseph Lambert/Jazzy Photo. In all the lamentation about the death of theater in Seattle, it is nevertheless clear that Seattle values its theaters far more than it values its dancers. By my last count, there were about three times as many theater companies in Seattle as dance companies. As a corollary, by my last count the amount of grant money going to theater companies compared to the money going to dance companies rates about eight to one. Dancers face the very same challenges as theater groups. Rehearsal space, performance space, support funding and so on. But quite unlike their counterparts in the theater, dancers tend to gather together out of necessity and fix their problems from within. No space? Use a non-traditional one (such as an architect’s office in Haruko Nishimura and Christian Swenson’s Skirmish). Need to educate your public? Start a topical series of dialogues (Velocity Dance Center’s Speakeasy Series). Want a showcase for local talent? Start your own. Marlo Martin rose to this challenge in 2010 by starting the BOOST Dance Festival. In its inaugural year the BOOST Festival intended to be a modest affair, featuring the work of Kristina Dillard, Kristen Legg, Gabriel Bruya, Kristin Hapke, Sarah Mercer and Ms. Martin herself in a single weekend at the Erickson Theater on Capitol Hill. To the surprise of some, the festival sold out completely to the gills both nights. It should have been no surprise. It was not just the quality of the artists themselves that drew such strong crowds but also the entire idea of the festival from idea to performance. Seattle’s dancers and dance followers were hungry for just such a showcase: something more personable, something less formal, some process in which communication would take place openly rather than behind closed doors, something more inviting to the community as a whole. Since that first year, the BOOST Dance Festival has expanded. Not just in size but also in mission: The festival now extends over two weekends and beyond being a catalyst for local choreographers and performers BOOST has reached out to other communities; in this case, San Francisco, bringing Project Tremolo and Jeanette Jing Male from the Golden State to show Seattleites another side of dance, making an already eclectic program even more diverse. Kate Wallich’s piece, Sound over taking your ears, volume taking over your body, is the most minimal. Where Ms. Wallich’s early work like -frequency is built upon points of contact both physical and emotional, Sound over taking your ears, volume taking over your body is built upon alienation. It is essentially two dancers moving in different circles, like two electrons around the unseen nucleus of an atom. Ms. Wallich’s secret classicism emerges here in the sparseness of means and the almost mechanically clean use of visual lines and curves. Diametrically opposite in approach is choreographer Iyun Ashani Harrison’s Union. The piece, which opens the show, fills its space to the bursting point. No clean, classical lines here. It is explosive and more than a little rough but eventually settles into something quite moving and beautiful. I have an immense fondness for the work of Kristen Legg and her entry in the festival may I…(my life as it is now) is a corollary piece to Union, more somber, more stately and more evocative. Ms. Legg’s work often shows a classical restraint and as passion intensifies with restraint her dance work often borders on heartbreaking. may I…(my life as it is now) certainly evokes this emotion lucidly. It is also a fine technical showcase for the lovely Mary Kirkpatrick who is one of my favorite dancers, as well as the steadily brilliant Carla María Negrete Martinez and Karena Birk. 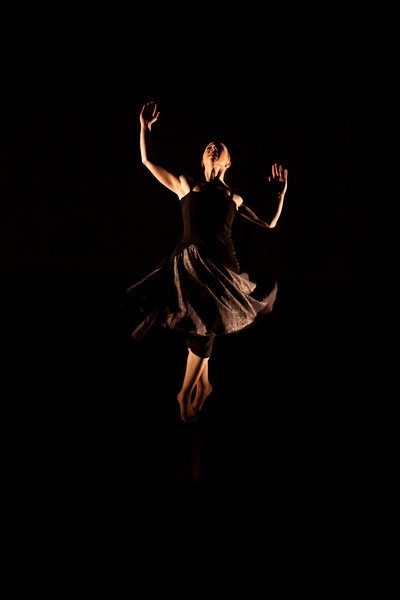 Ms. Birk also gets a lovely solo dance in Catherine Cabeen’s latest piece Gravitas. While some worry about the dark quality of some of Ms. Cabeen’s work, I found Gravitas by turns elegant, witty and even blissful: an excellent balance, doubtless helped along by Ms. Birk’s natural savoir vivre. Much of Ms. Cabeen’s earlier choreography is quite earthbound. Here the earth is also present but not so much as a tactile surface as a platform: this is an expert study of the body suspended between earth and heaven, returning to the ground by natural law, escaping once again by endeavor only to fall again. It is a fine piece, not nearly as grave as all that. Equally lyrical is the excerpt from Nowhere Space by Elizbeth Chitty and Suzanne Myre of Project Tremolo. On the surface, the piece is quite simple. A single square of light traps a single dancer while a second dancer plays freely in a larger, longer corridor fashioned of bright light. Eventually the trapped dancer escapes into the great light, and the two spaces blend into each other. But there is an element of doom about it: the self-contained movements that isolate the two dancers, the crack between a prison of light and a borderland of play–everything points toward an inexorable symmetry wherein the dance must surely fold in on itself and end almost as it began. Even when there is an active duet between the two dancers, it involves not cooperative movement but active attempts to push the other away. Cliché images of togetherness, freedom and other warm and fuzzy thoughts simply do not appear. The stage imagery is simultaneously tender and detached. The choice of music, too, is perfect. NorthWest Dance Syndrome’s The Snapping Point appears almost to be a Gothic horror tale brought to the dance. Murderous twins, a child with no face, an incestuous brother and sister, a mother whose bloodline literally entangles and traps her offspring–this compares to a dysfunctional family the way a nuclear warhead compares to a firecracker. The use of jumpy, eerie yet banal 8 mm film projection adds to the disorienting effect, strengthening the piece with an undertone of evil inevitability. The Snapping Point layers horrid image upon horrid image yet with a clinical eye that denies any sentiment or sensationality. It is most refreshing. I’d be remiss not to mention Marlo Martin’s own piece, tenSIDES, which closes the evening. Ms. Martin’s choreography is much like Ms. Martin herself: intelligent, sensitive, humane, vibrant. tenSIDES features ten wonderful dancers guided by an intelligent picture of space enigmatically filled with chairs. Only upon close and attentive viewing does their function become obvious. Ms. Martin concentrates largely upon the emotional space that binds the dancers together, leaving more subtle bits to the viewer. It was one of the most intellectually satisfying dances I’ve seen in awhile and Ms. Martin’s lack of exposition or explanation through sterotypical imagery shows that she holds an audience’s ability to think and feel in some high regard. More choreographers should do the same. At its heart, the BOOST Dance Festival is really a showcase for Seattle dance that might otherwise struggle for attention not because of any artistic deficiency but simply from the effects of neglect: dance audiences, too, have their own version of confirmation bias where they simply retreat into the personally familiar. BOOST Dance Festival does them all a great service by bringing factions of the audience together to see the breadth and diversity of the work that is not only possible in Seattle, but which is also already happening here. Ms. Martin has a clear vision of what she wishes to accomplish, and her panel of judges for the festival are obviously sympathetic with her curatorial sense. BOOST will undoubtedly sell out again as it has the past two years. It will probably expand again at some point and in fact already has: the festival has formed a bridge for San Franciscan artists that will likely extend to other cities as well. And why not? A connected community that accepts and celebrates its range of talent and material is a healthy and happy community. Ms. Martin says that she wishes to give back to the community. With BOOST, she has most certainly given back, and given back much more than one can accurately gauge. The prospects for this festival in the future are great. I have no doubt it will live up to them.